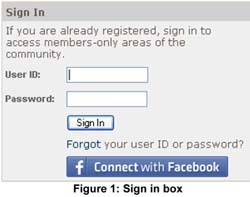 Once your Facebook login is tied to your online community (OLC) login, you will be able to log into the GAA's OLC with your Facebook credentials. 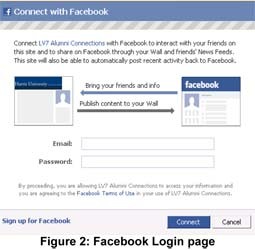 If you have not yet tied your OLC and Facebook logins together, you will be taken through the process of doing so when you attempt to use this new login feature for the first time. 1. Go to the Class Notes section of the GAA's Web site and click on the submitting a note online link in the first paragraph. A page should appear with the sign in box displayed. See Figure 1: Sign in box. If you do not see the sign in box, it may be that you're already logged in. If so, click the sign out link and repeat this step. 2. Click the Connect with Facebook button. The Facebook login page will display. See Figure 2: Facebook login page. 3. Enter your Facebook e-mail and password. 4. Click the Connect button. You will be logged into the OLC and redirected to the Class Notes submission page you initially requested in step 1. Learn more about sharing Class Notes on Facebook. If you have never tied your Facebook and Online Community logins together, you will be prompted for some additional information. This will be a one-time process so that going forward, the login process will be as described above.